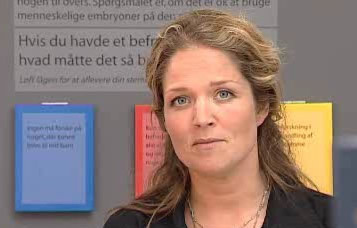 In 2004-2007 the research project ‘Creating Science’, investigating the cultural, social and ethical aspects of stem cell research, was conducted under the leadership of Lene Koch, Department of Public Health, Copenhagen University. 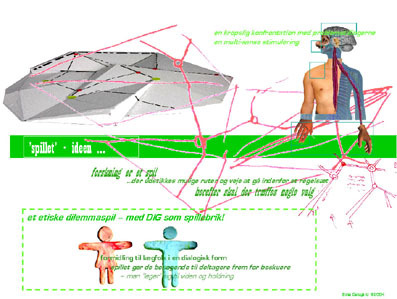 The project was financed by the Danish Social Science Research Council and included seven other social scientists (Mette Hartlev, Maja Horst, Lotte Hunniche, Klaus Hoeyer, Uffe Lind, Julie Sommerlund, Mette Nordahl Svendsen). The project took as its point of departure the conviction that stem cell research doesn’t fall from the sky as a fixed and ready made entity, but is shaped by – and shaping – the social context in which it emerges. 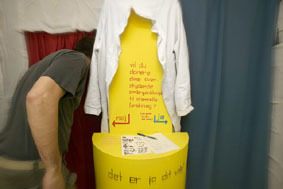 The project consisted of a number of different cross-disciplinary sub-projects which focused on different aspects of the making of stem cell research.In an effort to move beyond traditional forms of research communication, the project group collaborated with a spatial designer, Birte Dalsgaard, to create an experiment which would make communication of the knowledge production spatial and sensory. 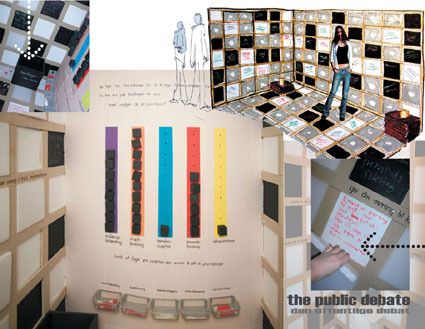 The experiment led to the creation of the installation ‘the Stem Cell NetWork – a Social Science Lab’ in 2005. 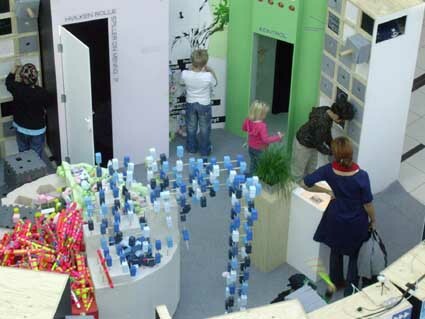 This installation was a test model of approximately 80 m2, whose overall message was to make the audience sensitive to the way in which society and technologies are created in mutual interaction through a long line of choices, actions and events. The model was built in the basement under the Department of Management, Politics and Philosophy at Copenhagen Business School. It was subsequently presented to various interested parties and tested on a number of focus groups. 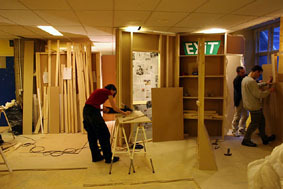 The construction and testing were documented in video. 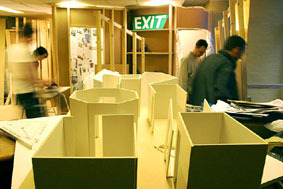 The installation was designed as a three dimensional gaming board, where visitors could move between a series of small rooms. Each of these rooms thematised social scientific problems collected from the different sub-projects in the research project. 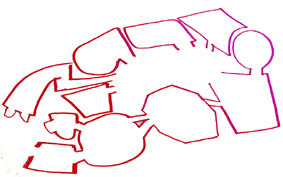 Together, the rooms illustrated the social scientific point that a specific phenomenon (eg stem cells) can be endowed with different meanings in different contexts (spaces). In each specific room the phenomenon was shaped in a particular way, which demonstrated certain problems and led to certain questions and forms of interaction. 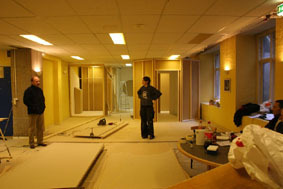 The rooms covered many contexts, such as the medical clinic for IVF (where the raw material for embryonic stem cell research, the fertilised egg, is produced), the stem cell laboratory, legislation, economic markets, patients’ everyday life, history, expectations towards the future, moral horizons and public debate.Visitors could pass through these rooms in different, but not completely random, sequences. In the room, ’the child factory’ visitors met a donation counter at the exit, where they had to choose whether they would donate their Embryo Nuggets or not. They chose by walking through a door. If they were willing to donate they chose the blue door and if not they chose the red door. As it appears in the pictures it was easier to walk through the blue door, because the red door was very small compared to a normal body. The scientific point in this connection is that many people receiving in vitro fertilisation feels it is somehow easier to say yes to donation. Visitors could think of themselves as their own gaming piece in this gaming board. Throughout the installation they were confronted with a number of different problematics and encountered different types of choices through physical meetings with different scenarios. The dialogical form was supported by the fact that the appearance of the installation changed in accordance with the different choices made by visitors. This was an illustration of the point that social problems are shaped and solved in social contexts. The installation was therefore not just a means for individual reflection and opinion formation. It was also a way of making this process visible as taking place in a social setting. 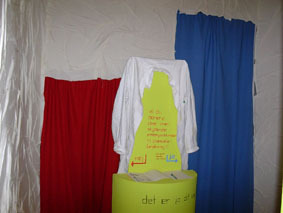 For instance, in the ‘public debate’ room, visitors were asked to decide whether an extra 100 mill. dkr should be given either to stem cell research, other fields of research or ‘worthy causes’. 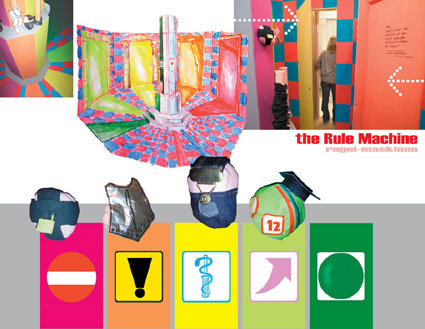 Furthermore, they could leave arguments for their priority in squares on the wall or floor – and they could cover or un-cover other visitors’ arguments. In this way, the room developed as a dynamic witness of the dialogue taking place under influence of the visit to the installation. Widen the understanding of the concept of research communication. It is not just about making people ‘understand’ scientific knowledge in the way researchers are expressing it. It is also about the process in which both parts interact in order to learn and become familiar with other perspectives, emotions, views and expectations. 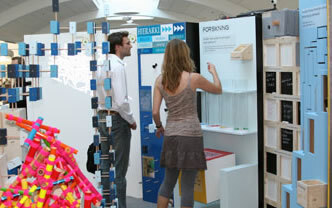 By means of this installation, the researcher is communicating with non-researchers. The focus group discussions were therefore an integral part of the project. Influence the visitors to have some sensation of their opinions on the subject matter. We pose questions which should make them interact with the installation, but the idea is not that they come out with a fixed set of opinions on stem cell research. To make visitors curious and induce a wish to participate. We hope to make them interested in more knowledge or in discussing the subject of ‘stem cells in society’. To illustrate some social scientific points – for instance that technologies are socially shaped and that this process is complex. To convey to the visitors that the creation of stem cell research is a continuing process, which is dynamic and can be influenced.